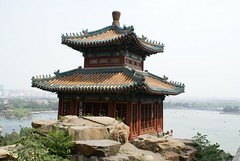 Beijing Tourist discovery continues with one of the famous park in town, the Summer Palace. 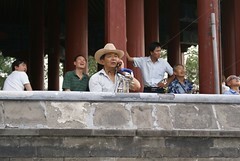 Practical tip: Entrance ticket costs 60 RMB and is available at the Ticket Office in front of the Park. Reduced ticket (20 RMB) is available but you can’t access all different places of the Palace. 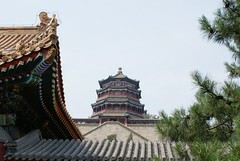 This temple was used by emperors as a refuge during long and hot Beijing summers. 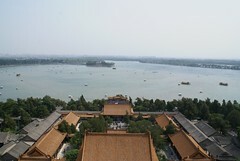 They moved from the insufferable torpor of the Forbidden City to this place during couple of weeks in July and August. The palace grouns, temples, gardens or bridges are a marvel of imperial landscaping. The Qing Emperor, Qianlong embelished this site from a royal garden to a real palace in 18th century. 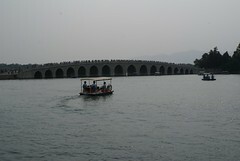 He deepened and enlarged the Kunming Lake with the help of more than 100 000 labourers. 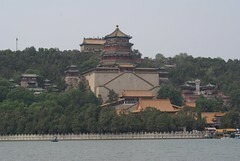 Summer Palace is one of the bigger Park in Beijing with Kunming lake in his center. 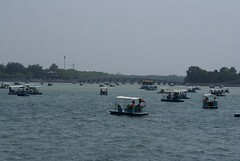 You can go around by foot but we decided to take the boat to the inner island (10 RMB). 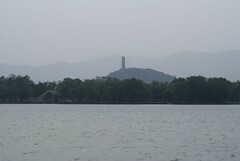 It give us the chance to have a great scenic view on the main Temple and also the Flagrant Hills, another tourist site which is closed to the Summer Palace. 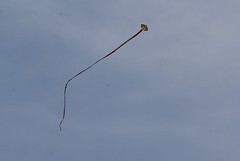 We also met the kite fans who are on every parks and temples in Beijing.